The Avocent HMX 2050 extender delivers uncompromised digital workstation extension across unlimited distances. Offering high quality crisp video and highly responsive mouse interaction, this network-based product also provides CD quality audio and seamless extension of USB mass storage devices. Media-intense applications such as video editing benefit from real-time user experience while mission critical media servers are securely maintained and managed. 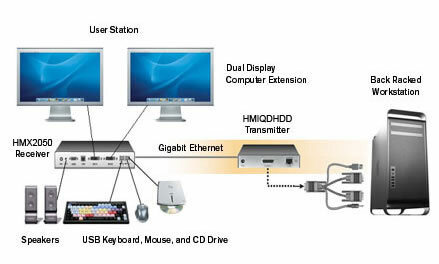 The HMX 2050 extension product consists of a transmitter that connects externally to each remote computer with dual DVI-D video connectors, and a receiver that connects at each user desk with dual DVI-I connectors. The HMX 2050 extender provides access from dual video monitor workstations to user stations using point-to-point extension over the same IP connection. The high quality extension provided by the HMX 2050 product is ideal for users who need a rich media dual video display experience while using TCP/IP as the transport protocol. The solution operates within the boundaries of a typical IP network. Question: Do you sell the power supply for this product? Answer: Thank you for your inquiry. Please contact you KVM Switches Online sales rep toll free at 1-877-586-6654 for ordering details. Question: Does this KVM extender connect Sun machines? Answer: Thank you for your inquiry. Both the user station and Computer Interface Modules are operating system independent and will work with Sun systems. Question: What USB spec for USB ports? USB 1.1? USB 2.0? USB 3.0? Answer: Thank you for your inquiry. The manufacturer has confirmed this device supports USB 2.0. Question: Does this comes with rack kit? what is the model of the rack kit? how about the peripheral cables interfaced on the on userstation (HMX2050) will they be provided in the package as well? Answer: The HMX 2050 User Station does not come with a Rackmount Kit. You have the option of standard rack mounting it using the RMK-45 Rackmount Kit (https://www.kvm-switches-online.com/rmk-45.html), or you can mount it to the rear of a flat panel monitor via a MMK-02 mounting plate accessory (https://www.kvm-switches-online.com/mmk-02.html). Question: When was the Avocent HMX2050 discontinued and what is the replacement? The HMX2050-001 was discontinued on February 28th, 2017, with the last shipment date on May 28th, 2017. 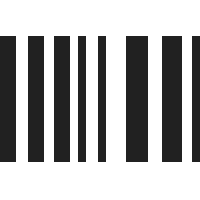 The HMX series has End-Of-Life support until May 28, 2022 (or last day of an extended warranty). The HMX series was replaced by the Avocent HMX5000 and Avocent HMX6000 series. Alternatively, you may also be interested in the similar AdderLink Infinity series. Please note however, HMX5000 and HMX6000 series units are not interchangeable with legacy HMX infrastructure. That being said, the HMX5200R-001 and the HMX6200R-001 receivers would be the closest direct replacements to the HMX2050.